Sailor Jerry will open its very own London venue later this month bringing rum, clothing, music, film and the original art of tattoo master Norman ‘Sailor Jerry’ Collins to Soho. Opening on Thursday 19th April, Hotel Street at 120-125 Charing Cross Road is named after Honolulu’s infamous Hotel Street District where Collins’ made his name. 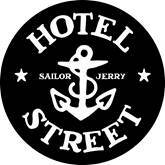 A gallery and store by day, and gig and dive bar by night, Hotel Street will be an all-round good place for bad people – open Tuesday’s to Sunday’s from midday to midnight, serving up the best Sailor Jerry Spiced cocktails in town. Hotel Street will make its own piece of history as it exhibits the iconic restored original flash artwork of the late Norman ‘Sailor Jerry’ Collins for the very first time in Europe. Paying homage to the father of old-school American tattooing, and the inspiration behind the spiced Caribbean rum that bears his name, the exhibition will feature 75 pieces of Collins’ legendary collection. Curated by Amsterdam Tattoo Museum founder and tattooist Henk Schiffmacher, the exhibition will showcase Collins’ values of independence, hard work and unyielding standards of craftsmanship to a new generation. …with many more to be announced over the coming weeks. Tickets will be available from 9am on Friday 13th April 2012 via www.Sailorjerry.com/uk, www.facebook.com/sailorjerryUK or in person at Hotel Street. Hotel Street will also host a fortnightly Sunday film club, starting on Sunday 29th April at 6pm. A selection of infamous cult classics and timeless rock n’ roll documentaries will be screened with titles to be announced soon. In another first for the UK, the official Sailor Jerry clothing and accessories line will be available to buy in person at Hotel Street during the day. Bringing Norman ‘Sailor Jerry’ Collins legacy and artwork to life, the range includes a selection of t-shirts, jackets, hoodies and belt buckles. Items from the brand new Hawaiian range will also be available exclusively at Hotel Street.